IEM 1754 2HBr is a selective AMPA/kainate receptor blockers for GluR1 and GluR3 with IC50 of 6 μM. Evans Blue is a potent inhibitor of the uptake of L-glutamate into synaptic vesicles, also an AMPA/kainate receptor antagonist. Xanthurenic acid, a molecule arising from tryptophan metabolism by transamination of 3-hydroxykynurenine, activates mGlu2/3 Metabotropic glutamate receptors (mGlu2 and mGlu3). Riluzole is a glutamate release inhibitor with neuroprotective, anticonvulsant, anxiolytic and anesthetic qualities. Spatial memory performance. a Latency to find the hidden platform. LPS-infused controls and Aged controls were impaired (*p<0.001) compared to young aCSF-infused rats. The performance of Aged rats improved across days only when treated with Ril (†t=0.035). b Distance. LPS controls swam a greater distance than aCSF controls and Aged controls (*p≤0.036). c Swim Speed. Aged rats swam the most slowly (*p≤0.001). d Thigmotaxis. Aged controls spent the greatest percentage of time within the pool perimeter (*p<0.001). CTEP (RO4956371) is a novel, long-acting, orally bioavailable allosteric antagonist of mGlu5 receptor with IC50 of 2.2 nM, shows >1000-fold selectivity over other mGlu receptors. 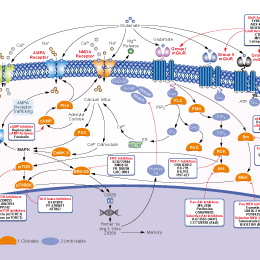 MPEP is a selective mGlu5 receptor antagonist with IC50 of 36 nM, exhibits no appreciable activity at mGlu1b/2/3/4a/7b/8a/6 receptors. LY404039 is a potent agonist of recombinant human mGlu2/mGlu3 receptors with Ki of 149 nM/92 nM, shows >100-fold selectivity over ionotropic glutamate receptors, glutamate transporters, and other receptors. Phase 3. LY404039 avoids reduction in phospho-Akt levels caused by DETA/NO. Total cellular proteins were extracted as described in Materials and Methods from astrocytes exposed to 1 mM DETA/NO6100 mM LY40403961 mM db-cAMP for 30 min, and 50 mg of protein extracts were assayed for phospho-Akt by western-blot. (A) Specificity of the western-blot was analyzed by incubating astrocytes with the PI3K/Akt pathway inhibitor, 20 mM LY294002, which completely prevented LY404039-induced Akt phosphorylation, and LPS/IFNc was used as positive control of Akt activation. Membranes were stripped and incubated with anti-total Akt antibody, which was considered loading control. (B) Data were expressed as phospho-Akt/ total Akt ratio and related to control group. Bars represent the mean 6 SEM of 4 independent experiments. *p,0.05, ***p,0.001 versus control, ‘‘p,0.01 versus LY404039. (S)-Glutamic acid (L-Glutamic acid) is an endogenous, non-selective glutamate receptor agonist. O-Phospho-L-serine, a molecule that mimics the phosphatidylserine head group and partially blocks microglial phagocytosis of apoptotic cells, is a specific group III metabotropic glutamate receptor (mGluR) agonist. ADX47273 is a potent and specific mGlu5 positive allosteric modulator(PAM) with EC50 of 0.17 μM, showing no activity at other mGlu subtypes. VU0357121 is a novel positive allosteric modulator (PAM) of mGlu5 with EC50 of 33 nM, is inactive or very weakly antagonizing at other mGlu receptor subtypes. VU 0364439 is a mGlu4 positive allosteric modulator (PAM), with EC50 of 19.8 nM. Piracetam is a cyclic derivative of the neurotransmitter gamma-aminobutyric acid (GABA), used in treatment of a wide range of cognitive disorders. VU 0364770 is a positive allosteric modulator(PAM) of mGlu4 with EC50 of 1.1 μM, exhibits insignificant activity at 68 other receptors, including other mGlu subtypes. VU 0361737 is a selective positive allosteric modulator (PAM) for mGlu4 receptor with EC50 of 240 nM and 110 nM at human and rat receptors, respectively, displays weak activity at mGlu5 and mGlu8 receptors, is inactive at mGlu1, mGlu2, mGlu3, mGlu6 and mGlu7 receptors, can penetrate into CNS. D-glutamine is a D type stereoisomer of glutamine which is one of the 20 amino acids encoded by the standard genetic code.